If this were a ‘normal’ season, or in other words, one in which Rangers were not in the bottom league, this year’s Division 3 title race would be one of the most keenly fought in recent memory. Taking Rangers out of the mix would leave the top four sides separated by just two points and anyone down as far as Berwick Rangers in seventh would have a realistic chance of being crowned champions in May. However, that is not the reality. The Rangers Leviathon sits a whopping 19 points clear at the top of the league, unbeaten since early October and on a run that has seen them drop just two points in their last 13 matches. Amazingly, though, this is not an unprecedented scenario in Scotland’s bottom league. A very similar situation occurred with Gretna in 2004/05 – a story that involved Peterhead at its centre and one which throws up some startling comparisons to this campaign that suggest the home side could pick up a shock win on Sunday. In that famous season, Gretna dropped just ten points in the entire campaign as they won 32 of their 36 games, scored 130 goals and conceded just 29, giving them a goal difference of 101, and accumulated 98 points – 20 more than their nearest challengers and a massive 48 ahead of the team in third place. Second place that year were Peterhead. The Blue Toon had a great season themselves, winning 23, drawing nine and losing just four. They inflicted one of Gretna’s two league defeats and also held them to a draw at Balmoor on their way to finishing runners up with 78 points. The point of all this is that John Sheran’s men are no strangers to chasing down a runaway train. 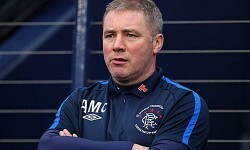 In fact, some will claim that the challenge of taking on Rangers is actually less daunting than that of playing Gretna in 2004/05, given that this month’s draw at home to Elgin meant that Ally McCoist’s men have already dropped more points this season than the legendary Raydale Park side did in the entirety of that famous campaign. More importantly, though, there is one other startling similarity with that season which suggests that history may be about to repeat itself. In that campaign, Peterhead held Gretna at home early in the season before beating them at Balmoor on January 22nd to inflict the Black and Whites’ only league defeat in 32 matches. Jump to this season and Peterhead sit third in the table, just one point off the second place that they occupied back then. They held Rangers to a draw at home early in the season, just like they did with Gretna eight years ago, and now they face them at home again on January 20th, almost exactly to the day that they derailed the Borderers, with the visitors in the middle of a long unbeaten run which resembles that of the visitors in 2005. The similarities are spooky and enough for me to put all logic out the window and take a punt on Peterhead again in this one. And if it pays off, it will pay off handsomely. The hosts are 10/1 to win on Sunday, meaning that new customers to bwin who use their free £20 bet to back a home victory stand to win £220 if successful. If you are less swayed by the supernatural and think that the similarities are nothing more than a strange coincidence, you will get odds of 1/5 on Rangers taking all three points, while the draw is 9/2. If Rangers do lose, however, their fans needn’t despair. Gretna won every single game they played after that defeat in the north and were crowned Division 3 champions at the end of the season.